Few things are more complicated and expensive than home theater audio components. Picking the right pieces is hard enough as it is, but figuring out how to properly setup those speakers can be downright hellacious. Plus your bank account hates it. But a sound bar can provide a single-item solution—whether your living room isn't built for optimal sound, or you're on a budget, or you're just not that tech savvy. Whatever the case, a sound bar is probably your best shortcut to a home theater experience. These aren't the end-all, be-all of audio. But they're pretty decent for the money. Here's the best way to make movies and music sound better for less than 300 bucks. We tested four soundbars, all with an MSRP under $300—and some are sold for even less than that. 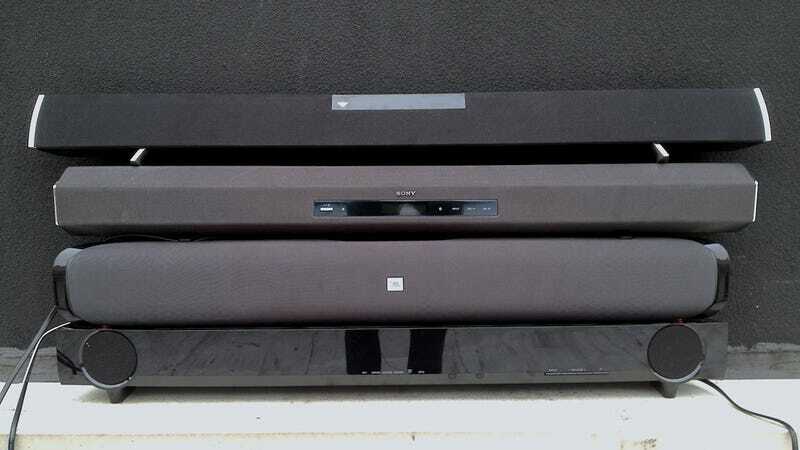 The sound bars themselves fall within the range of 60W-170W, and a couple have subs which add another 100W or so of power. We tested these in a symmetrical room roughly measuring 10' X 10' using a Sony Blu-Ray player connected via optical cable, along with an Apple TV—also connected via optical cable—for music and AirPlay purposes. For testing materials, we used the films Tree of Life (7.1 DTS soundtrack, 2.0 Dolby Digital soundtrack) and Planet Earth (5.1 DTS soundtrack) as our main test discs. We also streamed movies over Netflix, like Drive and Iron Man 2, to see how the Dolby Pro Logic audio performed. For music, we streamed 320kbps tracks from Spotify, spanning jazz, classical, hip-hop, rock, electronic and R&B. Virtual surround sound was considered in the testing, but as more of an added bonus than essential feature. After all, getting actual surround sound from a 2.1 soundbar is near mythical. Clarity and fullness of sound were the most important aspect when testing these bars. Had this thing been $200, it would have been fine to overlook it's homely design, cheap build quality, lack of inputs and configuration options, and non-existent low end. Because, at the end of the day, it doesn't sound all that bad for a cheap soundbar. Compared to the other products in this Battlemodo, however, it doesn't do a single thing better. The audio never sounds outright awful, but it's not nearly as detailed or full as the Sony or Yamaha products. It distorts at the highest levels, and the little bass it does provide just isn't satsifying. Toss in the fact that it only has an optical and 3.5mm input, cheap plasticky buttons, and a bass boost feature that offers no indication when its actually on, and its an experience that doesn't live up to its pricetag. • Speakers: Two 3.5-inch mid-range drivers, two 1-inch tweeters. The Yamaha YAS-101 is the most finely tuned of all the sound bars. Sound effects have texture, rippling and shimmering as the action unfolds. Music is full and precise, faithfully reproducing sound as it was intended. And the virtual surround sound is the best of the bunch—it mostly just widens the soundstage and makes everything sound more spacious—but it was the one I actually noticed. The inclusion of two optical inputs, along with coaxial and analog ins, is also a very nice touch if your TV doesn't spit out a Dolby Digital stream via optical, or if you want to stream music from an Airplay source without turning your TV on. But here's the problem with the YAS-101: Small sound bars need subwoofers. When watching a movie like Iron Man 2 or Drive, the lack of bass really affects the immersive experience. Listening to jazz and classical on the YAS-101 is fine, but anything remotely contemporary sounds a bit lifeless due to the lack of bass and low-midrange frequencies. There is the option to connect an external subwoofer, but the limited options for adjusting sound on the YAS-101 (main volume, subwoofer volume, stereo/surround) could leave you with mixed results. I'd love to hear this with a proper subwoofer (and that is coming soon, in the form the $450 YAS-201). But, as-is, the sound just isn't big enough for a complete movie watching experience. • Speakers: Two 2.5-inch full range drivers, two 3-inch woofers. 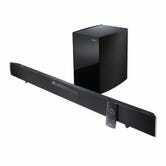 The Sony SA-CT260 is the best looking soundbar of the bunch. The hexagonal, mesh covered bar will look sharp in a modern home, and could blend in anywhere. 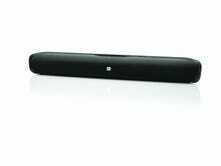 It also offers the most customization options of all the sound bars. In addition to bass and treble controls, you can adjust the base signal volumes of the sound bar and subwoofer, enable dynamic range compression (if the digital signal is still too loud at its lowest level), adjust the synchronization between image and sound, and tweak the auto-standby settings. Like the Yamaha, the SA-CT260 can take Dolby Digital signals up to 5.1, and DTS signals up to 7.1. Plus it has a Bluetooth connection available for playing music wirelessly. The sound quality from the bar itself is actually better than the Battlemodo winner—the Sony delivers detail and clarity, and the virtual surround is second only to the Yamaha YAS-101. But all this credit to the SA-CT260 is undone by the subwoofer. It's loose and boomy, but also punchy in a bad way. It generates a low-end sound that isn't smooth and complimentary. Instead, it's oppositional. And yes, you can tone down the aggressiveness of the sub, but it still can't mask the fact that it just isn't a very good component. It's a shame too, because this bar does so much else well. The Vizio SB4021M is the best in the test, despite the fact that it isn't clearly exceptional at one particular thing. The bar itself sounds good. The Yamaha sounds a touch better, but it lacks one thing the Vizio has—a fullness of sound that only a bigger speaker can provide. It doesn't have all the configuration options of the Sony, but you can tweak bass and treble to your liking. The sub isn't exceptional, but it's smooth and well-tuned enough to excuse the fact that it won't overwhelm you with awesome low-end. In a small room, it's more than enough bass for a movie. When a car crashes into a wall, or something explodes, it rumbles in a way that pleases the ears. The bar is better suited for movies and TV than it is music. But if you just want something to fill a room with tunes while you meander around the house, it works fine. It has optical, coaxial and analog input options, along with a USB port for playing music direct from a thumb drive. It doesn't handle DTS codecs, which limits its universal appeal in the high-fidelity arena. It's well rounded, and the small hangups don't make it deficient in any way. Here's the bottom line: The Vizio is the best tool we found to attain good, instant home theater sound. 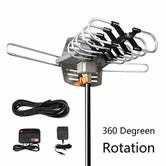 And, at $220, it's relatively cheap. For the price, you'll be hard-pressed to find a better overall experience. • Audio Codecs/Enhancement: Dolby Digital (up to 5.1), SRS TruSurround HD, SRS TruVolume.